Property Details: 3 BR, 3 BA Beachfront Residence, 2,600+/- square feet. Property Info: 3 Bedroom, 3 Bath Beachfront Unit, 2,600+/- sq. ft.
Silver Shells Real Estate, Destin FL. 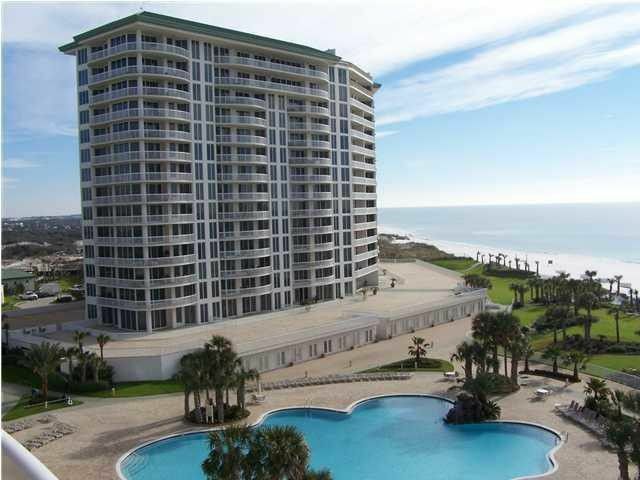 Destin Florida beachfront condominium home for sale at Silver Shells . This one-of-a-kind gulf-front resort home was just renovated, increasing the square footage and updating, making it an ideal family beach home. Boasting 11 ft. ceilings, large living area, new designer furniture, upgraded baths, designer kitchen, and two gulf front master suits, the updates are endless. Add that to a huge outdoor area that leads right to the pools and beach and you steps to the popular white-sand beaches. Floor to ceiling glass add a ton of natural light, with a water view from every room. The kitchen finishes include granite counter-tops with a built-in dining area, Viking range, Sub Zero refrigerator, Bausch dishwasher and tons of cabinet space with a built-in wine rack. Both master baths boasts custom cabinets and tile flooring, stone counter tops, twin sinks and more…come see this incredible residence today!